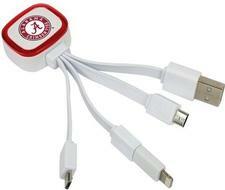 NCAA Tri-Charge USB Cable w/ Lightning Adapter - $24.99 - GolfersEdgeOnline.com - Best Golf Equipment On The Web! The Tri-Charge USB Cable with Lightning Adapter from QuikVolt features your favorite team logo and comes with an Apple Certified Lightning MFI Adapter. The full size USB cable plugs into your charging device, while the three Micro USB cables allow you to charge up to three devices at once. If you have any more questions about the NCAA Tri-Charge USB Cable w/ Lightning Adapter; do not see the model you are looking for; need custom options; or prefer to not purchase online, then please call us at (630) 656-1291.